Modern art by Sharon Werner, Sarah Forss, Abby Haddican, Carly Wright, and Kimberly Christenson. Werner Design Werks & friends are exhibiting fine art at BluDot during Art-A-Whirl on May 19th and 20th. We hope you’ll stop by! 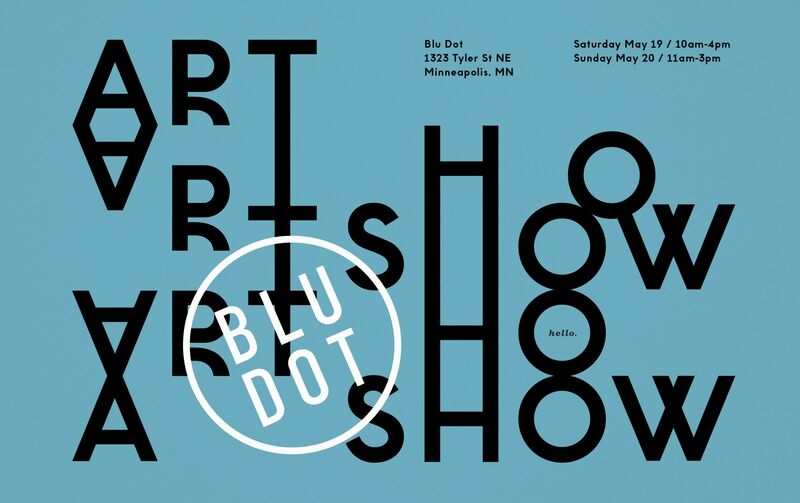 Blu Dot is located in Northeast Minneapolis, down the street from Bauhaus Brew Labs and within walking distance of many other Northeast breweries, coffee shops, and Art-A-Whirl locations. Parking will be tight, so we recommend car-sharing, biking, or walking into the area. There will be lots going on, so prepare yourself for an amazing weekend of fun and exploration in the Northeast Minneapolis arts district. Sharon Werner is the founder of Werner Design Werks. In addition to branding projects, Sharon is co-creator and co-author of a series of type-centric children’s books: Alphabeasties and other Amazing Types, Bugs by the Numbers and Alphasaurs and other Prehistoric Types. With an interest in art as it impacts culture and design, her paintings explore the environment in the form of color studies. Sharon’s work is included in 100 World’s Best Posters, the permanent collections of the Library of Congress, Musée De La Poste, the Victoria & Albert Museum, and the Cooper Hewitt Museum. Her work was included in Graphic Design: Now in Production, jointly organized by the Walker Art Center and the Cooper-Hewitt National Design Museum. Saint Paul based Sarah Forss is an award-winning graphic designer whose work was included in Graphic Design: Now in Production, an exhibition co-organized by the Walker Art Center and Cooper-Hewitt National Design Museum. She was also part of the College of Visual Arts Leaders of Design Series, WOMN: Women in Minnesota Design, as well as Here By Design, an exhibition at the Goldstein Museum of Design. She is the co-creator and co-author of a series of illustrated typographic children’s books including Alphabeasties and Other Amazing Types. Her work is part of the permanent collections of the Library of Congress and the Musée de La Poste. Sarah’s paintings are an exploration of optimistic color and form. Abby Haddican is a designer and artist who lives in Saint Paul. Her typographic, design, and illustration work has been recognized by PRINT, the Type Directors Club, the Tokyo Type Director’s Club, AIGA, Electric Literature, and American Illustration, and she was recently featured as a Communication Arts Fresh artist. Abby’s paintings are characterized by confident compositions, vivid colors, and a strong sense of play. Carly Wright is a Minneapolis based artist and designer. Her design work has been recognized in numerous publications including the HOW International Design Awards, Communication Arts, and AIGA among others. 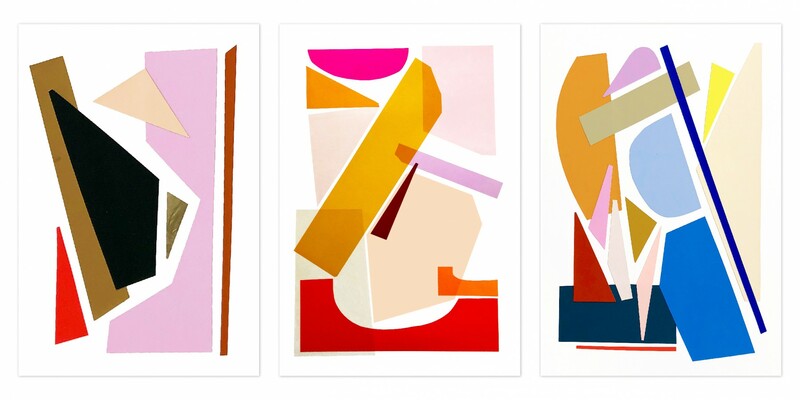 Carly’s mixed media compositions are joyful experiments of bold colors, graphic shapes, and rediscovered materials. In addition to the Saint Paul Art Crawl, Carly’s work will be on view in a solo show at Glam Doll Donuts April 9 – May 6, 2018. Kimberly Christenson is a painter working in abstraction. Her work, largely expressionist in nature, approaches form–color, shape, line, layers–with intuitive curiosity. She seeks to find a space in which emotion shapes itself through paint. Christenson has shown her work at her Twin Cities gallery, Evla, since the early 2000s. She received her BFA from the Minneapolis College of Art and Design in 1994.